On Monday, the great renewal of CBC television took shape, with all sorts of minor pointless changes new, attention-catching refreshening of look and feel. Nationally, CBC Newsworld was renamed CBC News Network, gained some on-screen furniture (a clock, weather, CNN-like animated lower-thirds, and an obnoxious non-transparent bug in the corner) and got a new schedule which has more one-hour shows and less 24-hour newsroom. The National was similarly changed to reflect the network’s new look (block serifs and pointless coloured square dots). Most importantly, Peter Mansbridge does the newscast standing up, which is kind of awkward. Changes in radio were minor: a new World Report at 5am for early risers, and additional local radio newscasts at 6:30pm (short) and 7pm (long). Online, very little has changed, other than the new block-serifed logo and the Inside Politics blog with Kady O’Malley, freshly poached from Macleans. But what interested me was the local television news. CBC Montreal hasn’t had a late-evening newscast in a long time, and I was curious how they would do this one ever since I heard about it last month. Considering some of the awful elements of the former graphics (especially business graphics and weather), most of these are significant improvements, even if they all strictly follow a national template. The silliness of the 90-minute newscast, repeating the same stories over and over again in a slightly different way, and having reporters do live chats with anchors that could easily be replaced by them just pressing play on the package, continues under this new look. The set is also the same. A full-page ad, which appeared in The Gazette on Monday, describes the 90-minute newscast as having “three convenient tune-in times”, which translates as “you can watch it any time you want, as long as it’s between 5 and 6:30”. I set my VCR (yeah, I still have one of those) to record the 11pm-ish newscast on Monday night. It starts at 10:55pm, taking a five-minute bite out of The National and a five-minute bite out of The Hour. I’m not quite sure of the reasoning behind this (it’s the same nationwide). A criticism of it is that people will miss the first half if they watch primetime TV instead of The National. That’s exactly what happened to me on Tuesday night. At 10:55, Peter Mansbridge ends the National, right after a fake-live chat with Jian Ghomeshi (I could tell it was fake because Ghomeshi was outside in broad daylight) by saying “keep watching your local news (sic), because it starts right now” – a generic statement because it applies to all local newses in all markets. Andrew Chang jumps in with “thanks Peter” as if Mansbridge was addressing him personally. Chang jumps straight into a brief about a sewer collapse, not so much because it’s an important story, but because it’s new and fresh. At +0:25, a story on the mayoral race and a radio debate, introduced live by Steve Rukavina in the newsroom. At +2:25, a throw to George Stroumboulopoulos, who gives a 15-second preview of The Hour and concludes with “and now back to the news”. Again, the response is “alright, thank you very much George”, struggling to fake a conversation even though Strombo is clearly not listening to him. At +5:10, a package (the only one of this newscast) from Joanne Vrakas on a new MRI machine at the Children’s. At +8:40, true to Chang’s word, the commercials come back after 6o seconds, and the weather guy (Ian Black filling in for Frank Cavallaro) gives as full a forecast as you can present in under a minute. At +9:50, Chang concludes the newscast, saying “we’re warming up the red chair” before he’s cut off by Strombo beginning his show. Going by the numbers, it works out to six minutes of news (all of it local), a minute and a half of weather, less than a minute of sports, and a minute of advertising (a minute and a half if you include the Strombopromo). That’s not bad, actually, though I could do with less “we’re only minutes away from” stuff. What really bugs me is the fake handoffs between national and local. The CBC should know better. They tried this with their ill-fated Canada Now, in which a national anchor would present the headlines at the start of the 6pm show, the local anchor would cut in with local news, jump back to the national anchor, and at 6:30 the national and local anchors would coordinate a fake throw to local news. It was awkward and forced, and I also believe somewhat dishonest. Hopefully the CBC will learn from its mistakes … again … and drop the fakery. We don’t care if the local anchor thanks Peter Mansbridge or not. The other thing that struck me is that the vast majority of the newscast is just Andrew Chang talking. Only the weather, Rukavina and Vrakas’s reports, and George’s 15 seconds involved anyone else talking. It’s a bit much. Not that I don’t like Chang’s voice, but it can get monotonous after a while. And if the guy can talk for 10 minutes straight without a break, what does he need a coanchor for at 5? Finally, I’m a bit disappointed by the online offering. The CBC is starting to put local newscasts on its video portal (it’s hard to find – you have to click down a few levels, including through “TV Shows” which is incredibly unintuitive), but there’s still nothing from Montreal. The best you get from CBMT is a recording of the 6pm newscast in crappy Windows Media. They could at least offer the late-night newscast in the same format, preferably downloadable as a podcast, for those who want to tune into the news after the fact. You are doing a wonderful job covering TV and the media in Quebec. It’s also good to find out that I’m not the only one getting excited when a newscast changes its graphics and on-screen appearance :) I must also say you are doing what I feel is the strongest analysis of the current “Save Local TV” debate, without “parti pris”. Anyone else notice that Pulse news (I refuse to call it CTV news) refreshed some of their graphics, music and the timing of certain segments? For example, world weather and markets was at 6:50 or so, rather than in the middle of the broadcast. Made me look at my clock just to confirm what time I though it was! CFCF’s new graphics are, like CBC’s, straight from head office. Unlike CBC, though, CTV seems to be redoing local graphics one market at a time. does anyone actually like those fake hand-overs? does anyone actually find newscaster banter charming or cute? i would’ve thought that in a self-aware age of new media the cbc would have taken this opportunity to make some changes in substance, like being upfront with viewers about the fact that peter mansbridge in toronto is not talking personally to andrew chang in toronto. what a joke. Quick note: That non-transparent bug covered up several bits of graphics, text etc on the newscast on Monday. Did they fix that last night? What’s up with making the anchors deliver the news standing? Are they trying to give them deep vein thrombosis? I have to say as well that this site is getting good at covering Montreal media. Please do keep up the good work. Now onto my comments. 1 – I do like having the CBMT news at 5pm. I’m usually at work at that time. And I’m on the road at 6pm. So, a 6pm newscast doesn’t work for me. At 5pm I turn on the TV, and have it in the background as I continue working. One thing that really bugs me is the banter. As well as the worhless entertainment stuff they throw in to cover time. I would prefer that they stick to news. Also, I don’t like being teased about a story that they’ll present at 6pm. Like I said, I’m on the road at that time. Please don’t tease news stories. I have the internet, and I’ll go away. So, give me the news at 5pm. 2 – Since CBMT has 90 minutes to fill from 5pm – 6;30pm. Why not do feature interviews in the studio the way PBS does in the Newshour. Not the whole show. But something that can run at either 5:40pm or 6:10pm. A 10-15 minute discussion with each subject would be great. Just this week, they could have spent each evening interviewing Tremblay, Harel, Bergeron, and O’Sullavin. The interview attempts on CFCF news is just awful. I caught one in which Takahashi interviewed O’Sullavin about her run for Mayor. It was just plain awful. 2 questions, and one was asked by “The Spoonman”. Wow! I learnt nothing about her policies if she was elected Mayor nor about the Ville-Marie Party. Congratulations again CFCF. 3 – Now about the news on CKMI. They run a National and Local news hour starting at 5:30pm. I would think somebody over at CKMI would have enough brains to have their news run from 6:30pm to 7:30pm. As I mentioned, I’m on the road at 6pm. I can’t watch the news. And there are plenty of other people in the same situation. If CBMT runs a early news at 5pm, they grab and hold onto the news junkies probably until 6pm. Some will switch over to CFCF at 6pm. If CKMI ran their news from 6:30pm, they can begin to pick up viewers from the CBMT news. Then by 7pm viewers will leave CFCF, and go to CKMI by 7pm. Plus, they can pick up viewers like myself that will get home between 6:30pm and 7pm. This would be a lot better than both CFCF & CKMI jamming Hollywood Gossip shows down our throats. Both of them run this crap from 7pm-8pm. Just awfull programming. I know some people like this sort of stuff. But both channels running it at the same time? CKMI can place of of those ET shows at 6pm or earlier. I agree that it’s silly for three anglo stations to run their evening newscasts simultaneously. But Global running at 6:30 would mean everyone tunes in to CFCF (which most already do) and they stay with that station until 7. I think moving it even later, to 7 or 7:30, might make more sense. Or even 10. Although it’s not exactly the same, the chunky-serif typeface and colourscheme reminds me a lot of The Guardian newspaper (http://www.guardian.co.uk/) in the UK. Now it is a patchcord plug of PRI from the States, RCI domestic service, and drivel from the BBC. Is it possible to watch the National from Monday online? All I can find is yesterday’s (28th). Monday’s National On Demand is online. It doesn’t look like they upload the full National. Sure way to save a salary and out it into news gathering is to have the same anchor do all the hosting of the early and late shows. As for the contrived throwing from one show to another TV is full of it. Next year look for anchors to be juggling or spinning plates. When Mansbridge goes home to relax, does he change into a suit now? That shirtsleeves bit is ridiculous. 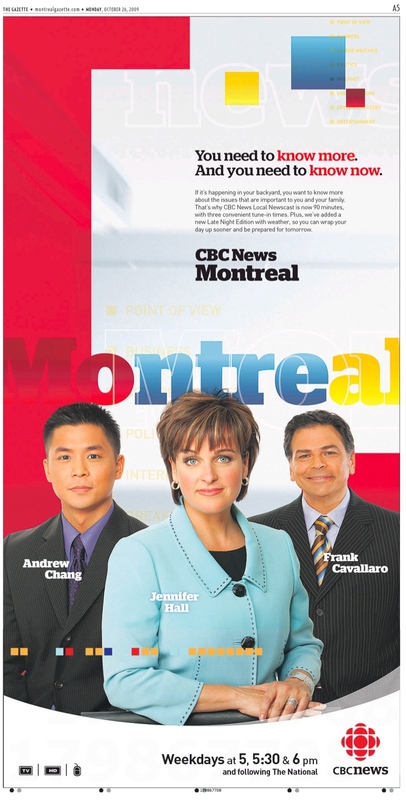 Note that the 3 Montréal presenters (including the weatherman) are all in suits. I thought I had a pretty good read of local Montreal news (mainly of the daily shenanigans at Pulse), but that was before I discovered Fagstein’s by-the-second analysis! Keep up the great work! I would wish all 3 English newscasts would learn a lesson or two from Radio-Canada’s 6PM Téléjournal. Patrice Roy has settled quite nicely into the role left by long-time anchor Bernard Derome. The show’s not perfect, but it delivers a good chunk of local news, in-depth interviews, and doesn’t go the weather well multiple times nor engages in useless chit chat. CBC overnight has been ruined by the changes,who’s the Einstein behind this one and when has it been necessary to preface the introduction of new hosts with commentary such as “repuatable journalist” as has been the case of the new guy??? Peter?? ;I WILL DECIDE IF HE’s CREDABLE” and he’s NOT,stop messing around with the CBC,if it’s NOT broke,it doesen’t need fixing.